IT'S OUR 55th! GREAT NEWS! OUR REUNION PLANS ARE ALL SET! our plans. our celebration will be a Saturday night dinner and a Sunday morning brunch. The email has all the dinner information. The brunch email will be forthcoming. Looking forward to seeing everyone again!!! WITH NO 4 - HOUR WAIT! 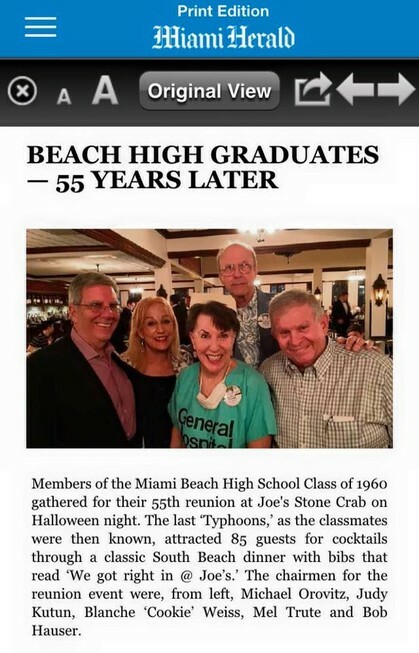 BE SURE TO SAY "MBHS Class of 1960 Reunion"
Miami Beach High School Class of 1960 IS THE OFFICIAL WEBSITE to enable classmates to reunite with former friends~~ POST REUNION! This site will keep YOU informed of upcoming events and updates. The 50th reunion held at the Eden Roc October 8, 9, 10, 2010 was FUN, and this user-friendly site will ensure you stay connected. Reminder to TURN VOLUME DOWN on your computer. Find gray box and click JOIN NOW. Locate your name, and follow the "prompts" to complete the 5 Wizards. 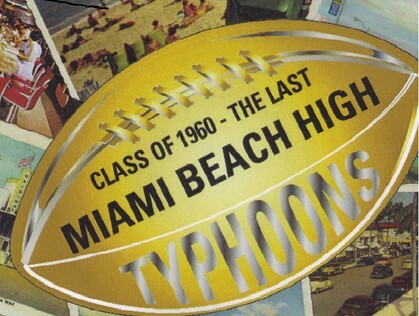 Congratulations on becoming a member of the CLASS of 1960 WEBSITE----THE LAST MIAMI BEACH HIGH TYPHOONS! Revisit regularly....Beach High Typhoons Class of 1960 website and the announcement section of the site for updates.